Chiel Mendel Melman (now Max Melman) is the son of Abraham Yitzhak and Bracha Goldblum Melman. He was born on July 11, 1929 in Ozarow, Poland where his father made a living as the owner of a grocery business. Max had two sisters, Ida (b. 1925) and Madeleine (b. late 1940s). Max was educated in a cheder (religious primary school) until he left Poland at the age of seven. In the early 1930s, the Jewish community of Ozarow endured numerous anti-Semitic attacks. The deteriorating situation led Max's father to leave for Paris, France is 1932. There he lived with his wife's sister-in-law and opened up a wholesale tailoring business. By 1937, he was sufficiently established and could then bring his family to Paris. After moving to Paris, Max was sent to public school, which he attended until June 1942. The Melmans remained in Paris after the German occupation, though many of their relatives fled to Vichy. Beginning in the spring of 1941 with the deportations of foreign-born Jews, the family's situation deteriorated quickly. For a time, Max's father was forced to leave home every evening to avoid arrest. 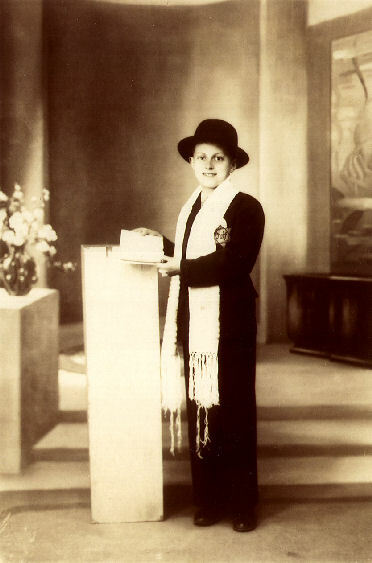 In June 1942, just ten days after the decree was issued requiring Jews to wear a yellow star, Max had his Bar Mitzvah at the synagogue on the rue Notre Dame d3e Nazareth. Three weeks after Max's Bar Mitzvah, on July 16, nearly 13,000 Parisian Jews were seized from their homes and interned in the Velodrome d'Hiver. Fortunately, the Melmans were tipped off beforehand and were able to find refuge during the most dangerous period in the home of their concierge. When the situation calmed down, the family returned to their apartment, where they remained until the end of 1943. For three months during this period, Max and his sister Ida were hidden separately from their parents in the home of a French woman outside Paris. They were so unhappy there, however, that they ran away and rejoined their parents in Paris. From the end of 1943 until August 1944, the Melmans were hidden with two branches of the Castera family in Versailles. Following the liberation, the Melmans returned to Paris, where they had to wait another two years before being able to repossess their apartment. Max went to work with his father in the tailoring business. In 1957 he married Micheline Giertner, a French Jew, who had survived the war in hiding in southern France. Their first child Marc was born in 1958, followed by a daughter Martine in 1961.